Early on it became important for the 18th hole to be flexible in its final design. It was to be the last of the first five holes designed and built so that it could be adjusted as necessary. The possibility existed that 200,000 cubic yards of material would have to be used from other development areas due to timing issues or lack of readiness in other areas. 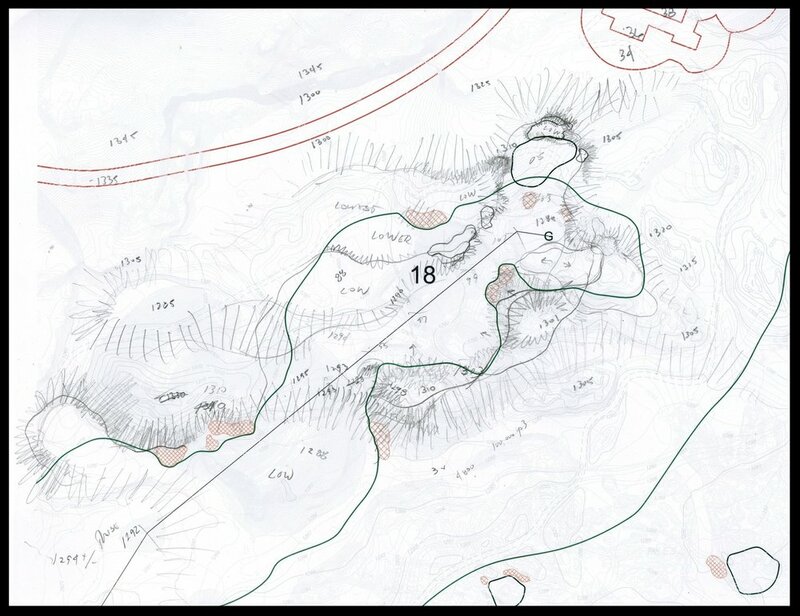 This first rough design took into account this volume of material and used the similar tall stockpiles that initially existed on this hole as the key feature or design element. It also allowed us to hide the tremendous rock face near the second landing area until the golfer walked through two large features, something we valued from an experience perspective. 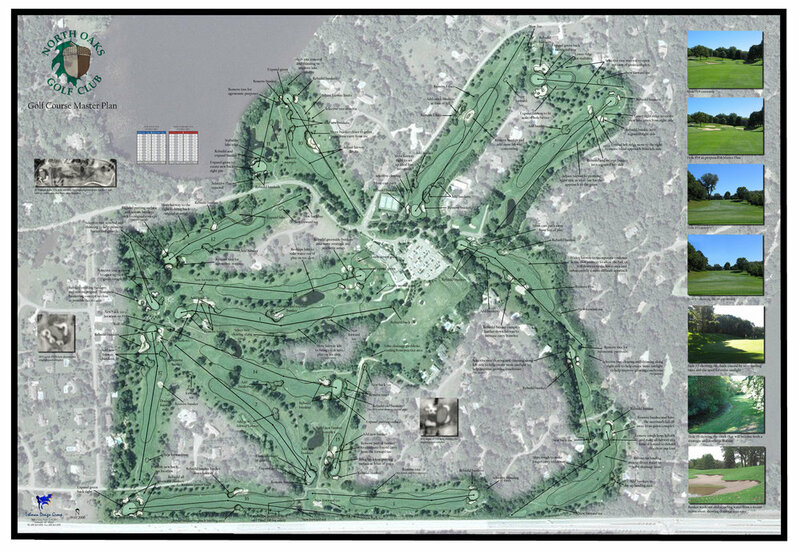 During the next year or so many changes to the community center and golf course clubhouse location and concepts were introduced to the overall site plan. We were constantly adjusting the location and elevation of the green to better relate to the new or adjusted concepts. The overriding concern was always that we wanted to enjoy and experience the 18th hole in some manner from the clubhouse. With about six months until construction started on the 18th hole and just before the holiday season, we were asked by one of the clubhouse architects to raise the green almost 20 feet or more if possible. Some of that was simple as we had located the green in a natural depression which would have created a nice downhill approach shot had we been able to keep that idea. We took a few weeks looking for ways to raise the green, shift it slightly and still create a great finishing hole. We really don't like perched greens for any reason. While it took some time, the idea of creating a bench between the 1st and 2nd shot was explored. We still had to gain elevation from the start of the bench to the green but at least the green would not be isolated and instead built into a gradual rise. We still did not know how much material we had available but this approach used about half of the original 200,000 yards which seemed like a good place to be. The plan shown to the left was not our first grading plan but at this point we could not wait any longer. We had to construct the irrigation pond or we would have no chance to ever meet the first grassing window. We decided we could build the tees, the pond and out to a point just beyond the pond. We committed to two corridors where we would place the mainline with one heading south and one heading north. Along with the engineering team we also designed this area to retain just over 100 acre feet of water. We used the irrigation pump system to manipulate the storm water as necessary. It was a lengthy and fairly complex part of the project but we completed the plans and constructed the pond in good order. We had a working irrigation system when we needed it. The biggest challenge during the construction of the pond was the depth of the intake line. We had to keep the pump station above the 100 year flood limit while getting the intake line to just above the bottom of the pond. This created a situation where we had to carve a channel just under 40' to lay the pipe down. It took a couple of scrapers some time and effort to get this accomplished with a lot of material moved twice in a very small space. At this point the 18th hole was about 50 percent complete with little idea how we would be able to finish from the pond through to the clubhouse. Everything was still up in the air. We still had most of the material stockpiled on the last part of the golf hole but were using and removing it as fast as we could. From this point forward the 18th hole was built in the field. There was not going to be any extra material used for the hole, no requirements for final green elevation and with new retention basins lining the left side of the golf hole we had most of the hole with some sort of hard edge. We had to find the best way to connect all the pieces. Two key decisions were made at this point. The first, with the help of DMB, was to create, using explosives, the dramatic rock backdrop back and left of the green. DMB had a good idea that it could be something special but that we wouldn't know for sure until after we exposed the face. It was a very exciting day with an excruciatingly slow clean up until we knew for sure. It turned out as well as anyone could have hoped for. The second fortuitous choice was the availability and necessity of using d9 dozers to expedite the final shaping, we had no time. It allowed us to finalize and enlarge the very large shape left and short of the green and to add large forms to the right of the green. It allowed us to create wonderful and dramatic lows coming in and out of the fairway. Large dozers create wonderful shapes that smaller machines really cant. We were able to bring in very large boulders that helped define the green complex and give a natural appearance and great back edge to the bunker right of the green. It was very important to us that this hole, which starts with a view of everything, ended up with a very secluded, intimate and rocky setting. We very much enjoyed the contrast between the two elements and are hopeful that everyone else appreciates it as well. The greens construction was a tremendous experience for us. Again, without the d9's, what we ended up with would have been difficult. The material that the green subgrade was built on could only be moved with a large dozer and just barely at that. We had to rip a few inches of material at a time and shove that material towards the tee. If you're on site a lot you have a chance to be there when opportunities arise. We were on site a lot. After pushing material and getting shapes that were manageable, a low developed on the front right that was there due to pushing material to the left. It was the first solid idea for finishing the green. We had a large rock outcropping that we hit on the front left, we kept it large like it was. We had a large roll off to the left that we loved and after some time we finally had a green that was pinnable and interesting. It took a lot of effort by many but the 18th green is something we are very proud of and something we thoroughly enjoyed creating. A big thanks to DMB for allowing us the opportunity. We are always exploring new ways to show how a golf hole might look long before we build it. Its the one thing everyone wants to see. We try to always give enough detailed information to help best explain the scope of work. As the example above and below shows we use multiple methods to share information. We use software that allows us to alter photographs of existing golf holes and show how it might look after being completed.